1 – Politicians are more concerned with reelection than with doing what is right. 2 – Money is power. It becomes very important to those seeking reelection. 3 – Government agencies are poor managers. 4 – The media does not always present reality. Choose your media sources wisely, and use common sense when separating fact from fiction (ie. what does not pass the “smell” test). 5 – When in doubt, refer to Principle 1. We have all been first-hand witnesses to the gridlock that is taking place in Washington, D.C. Sequestration has become the word of the year, as it supposedly went into effect on March 1, 2013. In political terms, our country was facing a fate worse than death because $90 billion was going to be cut from the budget. Panic, pandemonium, unemployment, starvation and other plagues that have not occurred since biblical times were going to befall us, all because of these spending cuts. And that was just what the President was saying! Let me put this into perspective. Suppose you go to McDonald’s and spend $9.80 on fast food. It fills two bags, so you have your hands full. You give the clerk $10.00 and receive 20 cents in change. As you are walking to your car, the two dimes falls out of your pocket. You see them roll on the ground under your car, but it is only two dimes. Rather than bending down and getting the money, you get into your car and drive happily away with your Big Mac in hand. That 20 cents represents a larger percentage of the $10.00 than the $90 billion is to what the government spends. Okay, my math is a little skewed, but you get the point. The true controversy of sequestration is where the cuts are being made. Rather than slashing social welfare programs, about half the money will come from the defense budget. The real issue at hand is the fact that the federal government will run out of money again on, or about, March 27, 2013. For the umpteenth time, we are hitting the debt ceiling. Will any true spending cuts be made? We will know shortly. Now, let’s discuss Social Security. My Five Principles for political decision-making come into play concerning this subject. I want to make one thing perfectly clear! Contrary to what politicians say (only to get reelected – Principle 1), and what the media panders (Principle 4), people currently on Social Security are not going to lose Social Security. That does not mean that we are secure from a cut in benefit, but we will not lose Social Security. Social Security refers to the Old Age, Survivors, and Disability Insurance (OASDI) federal program. The original Social Security Act was instituted in 1935. Social Security is primarily funded through payroll taxes called Federal Insurance Contributions Act tax (FICA). Because of the Great Depression of the 1930s, it was determined that over 50% of the senior citizens lived in poverty. The Act was an attempt to limit what were seen as dangers in the modern American life, including old age, poverty, unemployment, and the burdens of widows and fatherless children. In 1937, there were 53,236 Social Security beneficiaries at a total cost of $1,278,000. In 2008, there were 50,898,244 beneficiaries with a cost of $615.3 billion. How times have changed! But like all government programs, good intentions paved the road to hell. Times have changed in other ways. In 1937 the retirement age was 65. Today, if you are born after 1960, the retirement age is 67. So far, so good. But the average life expectancies in 1935 were 59.9 years for men, and 63.9 years for women. In 2010, the average life expectancy for a man was 76.2, and for women 81.1. Demographics indicate that a 65 year old person living today has a 1 in 4 probability of living to age 90. A baby born today has a 50% chance of living to age 100! Are you beginning to see the problem? The Social Security System has been equated to a Ponzi scheme. The vast majority of the money you pay in Social Security taxes is not invested in anything. Instead, the money you pay into the system is used to pay benefits to those “early investors” who are retired today. When you retire you will have to rely on the next generation of workers behind you to pay the taxes that will finance your benefits. As with Ponzi’s scheme, this turns out to be a very good deal for those who got in early. The very first Social Security recipient, Ida Mae Fuller of Vermont, paid just $44 in Social Security taxes, but the long-lived Mrs. Fuller collected $20,993 in benefits. Such high returns were possible because there were many workers paying into the system and only a few retirees taking benefits out of it. In 1950, there were 16 workers supporting every retiree. Today, there are just over three workers. By 2030, it is projected we will be down to two workers. As with Ponzi’s scheme, when the number of new contributors dries up, it will become impossible to continue to pay the promised benefits. Those early windfall returns are long gone. When today’s young workers retire, they will receive returns far below what private investments could provide. In retrospect, it took a Depression, a Great Depression to cause the implementation of the program. No such depression has been experienced since. Additionally, the baby boomers provided the ultimate acceleration of this program. Firstly, this was due to their big influx into the workforce, providing a record breaking number of contributors, and now, because they are retiring. And during the Vietnam War, when LBJ was the President, Social Security contributions were used for the first time to balance the budget and cover the war expenses. Every President has done it since then. So now what do we do? Here would be Grandpa T’s Common Sense Solution. Secondly, we need to allow people under the age of 45 or 50 to have individual retirement accounts. They could invest up to 25% of their income into investments of their choice, tax deferred. They would still have to fund the existing program by paying a reduced amount of FICA. Today the employee and the employer both pay 6.2% to fund the program. Perhaps this could be reduced to 4% each. People investing their money judiciously could earn 4%-7% average per year. Over the lifetime of a young worker, these returns would be huge compared to Social Security benefits. The Social Security Fund investments have yielded less than 2% over the life of the program when there was money to invest. I will guarantee you that young workers today would jump at this opportunity. There are very few people under the age of 40 that believe Social Security will be available when they reach the retirement age. They expect the program to go bust. They may be right! What happens when that generation takes the reins of Congress? 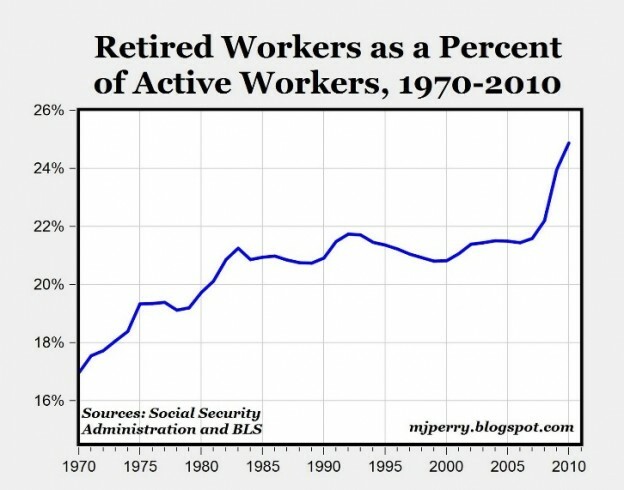 And the young workers do not want to foot the bill for today’s retirees. As mentioned, they and the employer pay 6.2% each in FICA. In 1935, this amount was 1% each. In reality, no one complained when the boomers were in the workforce. But today, there is no end to the complaints that the boomers, a large glut of our former workforce, are now retiring (to the tune of 10,000 retirees a day). Thirdly, we need to raise the age of Social Security beneficiaries. It may be time to raise that age to 70. Of course, a younger person who is not in the Social Security program can retire whenever they think they can afford to retire. Lastly, the existing beneficiaries may just have to take a cut in benefits. Yup, that includes Grandpa T. To assure the continuation, rather than the total loss of benefits, we may all have to “bite the bullet” for a 5%-15% cut in benefits. People currently receiving Social Security payments typically draw out more money within six years than they contributed overall. This, combined with longer life expectancies and a declining workforce, has created a lingering debt that will eventually become an unmanageable burden. If anything will take away Social Security from current recipients, it may well be that unaffordable burden. Will anything be done to save the system? Will Washington contact Grandpa T for his ideas on restructuring the Social Security program? Probably not—on both counts. Why? Because our gutless Liberal representatives in Washington will scream, with the help of the willing media (Principle 4), that the rotten, mean Conservatives are trying to take away their Social Security. They will do this to retain votes (Principle 1) from the gray panthers to assure their support during election years. Unfortunately, many of these retirees will believe this propaganda. Additionally, government (Principle 3) would be taking in less funds (Principle 2), and this would require the federal government to downsize. There are very few egocrats in Washington that want smaller government. Those measures would reduce the size of the kingdom. Don’t misunderstand what I have said. There are some forthright representatives from both parties that recognize that the program needs to be drastically revamped in order to survive. Everything short of a public lynching has occured within the media against these people whenever the subject is even discussed. Will anything close to my suggestions ever be implemented? Unfortunately, no. That would take many more smart, fiscally conservative representatives being elected by a less greedy electorate. This entry was posted in Common Sense Solutions, Political Opinion, Politics and tagged baby boomers, political decision making, political principles, social security reform on March 14, 2013 by Grandpa T.